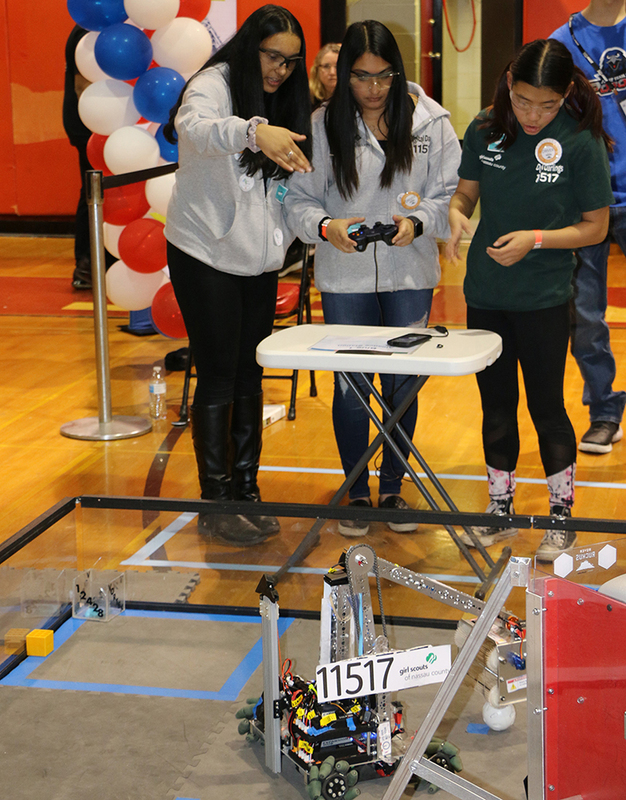 Members of Team #11517 “Digital Darlings” of the Girl Scouts of Nassau County in Garden City program their robot during one of the playoff matches at the FIRST Tech Challenge Long Island Championship at Syosset High School on March 9. “Digital Darlings” was one of three teams that were chosen to advance to next month’s FIRST Tech Challenge World Championship in Detroit, Michigan. Three Long Island teams are advancing to the FIRST® Tech Challenge World Championship in Detroit Michigan after competing in a series of local tournaments, including the Long Island Championship that was held at Syosset High School on Saturday, March 9. Presented by School-Business Partnerships of Long Island, Inc. (SBPLI), the SBPLI Long Island Championship featured 24 teams vying for the opportunity to compete for a chance to advance to the FIRST Tech Challenge World Championship in Detroit, Michigan on April 24-27, 2019. The three FIRST Tech Challenge teams that received a spot at the World Championship were Team #10738 “Stony Brook Bears” from Stony Brook School; Team #6438 “Syndicate” from Syosset High School; and Team #11517 “Digital Darlings” from Girl Scouts of Nassau County in Garden City. In addition to being recognized for advancing, each of the teams also received numerous awards that were presented during a ceremony following the FIRST Tech Challenge event, which are outlined below. Additionally, three students were named FIRST Tech Challenge Dean’s List Finalists during the awards ceremony: Cameron Best of Team #13847 “At Least It Didn’t Explode” from Harborfields High School in Greenlawn; Andreas Kaímís of Team #12387 “Dagas” from Half Hollow Hills High School in Huntington Station; and Gabriel Wong of Team #4017 “Robopandas” of Sewanhaka High School in Floral Park. Sponsored by the Kamen Family, the FIRST Tech Challenge Dean’s List Award celebrates outstanding student leaders who present a passion for attaining FIRST ideals and have led their teams and communities to increased awareness for the program. FIRST Dean’s List finalists and award recipients are highly recruited to some of the country’s top colleges and universities. As finalists, they will have the opportunity to become one of 10 students to receive the award, which will be presented at the World Championship in April. Victoria Mercouri of Team #7035 “Radical Robots” of the Girl Scouts of Suffolk County in Bayport received the Compass Award. This award is given to an adult coach or mentor who has provided outstanding guidance and support for a team throughout the year and demonstrates to the team what it means to be a Gracious Professional. Throughout the season, the teams, comprised of students age 12 to 18, used their problem-solving skills, creative thinking and sportsmanship to build and program robots for FIRST ROVER RUCKUSSM (presented by Qualcomm), during which two alliances of three teams attempted to score as many points as possible by having the team’s robot descend from the Lander, collect Minerals from the Crater, sort and score Minerals into the Cargo Hold of the Lander, perform autonomous tasks and navigate to specific parts of the Playing Field. * Denotes teams advancing to the FIRST Tech Challenge World Championship in Detroit, Michigan on April 24-27, 2019. Local sponsors included School-Business Partnerships of Long Island, Inc. and the Syosset Board of Education; national sponsors included Qualcomm, Rockwell Collins and PTC.